Camera equipment is expensive... and breakable! The solution... camera backpacks. These lifesavers keep your camera gear safe and you always know where everything is. Canvas camera backpack loading from the top. It also has pockets with zippers for cords, filters and other smaller pieces, plus a computer section. Yuck, so much stuff -- so much weight! Flowers and gardens are there to be photographed. It's just so much trouble to haul all that camera gear along. You can keep using your cell phone,,, after all, it's always with you. But, it doesn't always fill your photography requirements! It's time to think of a fix. How much gear do you have? Let's look at camera backbacks and camera bags. Which one do you need for your stuff? Cost is always important. Choose good value for whatever amount you spend. Weight is a huge factor. Think about your age, your physical condition, how long you'll be carrying it at one go. Size - I mean both you and the bag! The two of you have to be a good fit. AND will your bag hold everything you need to carry PLUS MORE. You'll also need to carry your water bottle, a jacket, mitts, your notebook. Can it hold your laptop? Important or not so much? If you are flying, Is is within carry-on requirements. NEVER put camera equipment or laptops in your checked baggage! Or your last will and testament, or your life savings.... okay, you get the point. Padding in camera backpacks is important because life has its hard knocks. Make sure there's enough padding in your final line up of camera backpacks to protect your equipment from bumps and bruises. Digital cameras and lenses have delicate constitutions! Weather proof - What if it rains or snows on your parade? Electronics and moisture aren't good bedfellows! 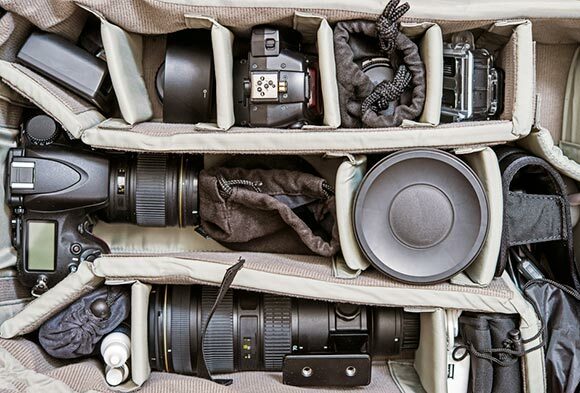 The top view of a professional photographer's backpack. It houses several lenses plus camera body, filters and more. This pack will be costly but worth it if you have lots of equipment. National Geographic - I have one but I only use it when I'm carrying all or most all my gear with me. Victorinox - also at the Bay or on Amazon... google for other sources. Jill-e bags - want to look cool? They're on Amazon and e-bay as well as their own site. Lowepro - every photographer knows this brand. Kolon Sports - A very successful South Korean sporting goods company. Maxpedition for the serious outdoor person who loves photographing alpine wildflowers. 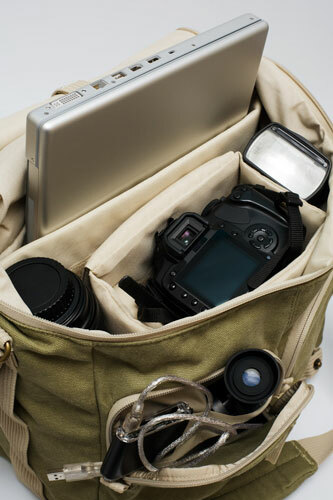 Think Tank Bags - for the fashionable photographer. Shootsac - more choices for the fashion conscious flower and garden photographer! Something for everyone! My first go-to site for research is Amazon because everything is in one place. When you find one or two you really like, follow the links to check them out with the company or dealers as well. And go to the company's website since it may have more information than Amazon. You can also check review articles on the internet. Here's one review that compares 5 top-rated backpacks. Did your camera backpack come with a rain-proof cover? You'll find it folded up neatly in a little pouch inside. Wonderful -- But don't expect it to work if your bag gets dunked in the creek! eVac Dry Sacs - Lightweight, heavy duty, waterproof fabric bags - similar idea to the plastic bags you use to save space in your suitcase. Extract the air and voila - waterproof and more space! Your clothes look a little like they're freeze-dried! Now this is for serious outdoor activity... not the average fair weather garden visit. See Pouch or similar water-proof travel bags of all sizes. Get them at any travel accessory store or search the internet. Use a separate pouch for each lens or put several filters in one pouch. Some camera bags and photography backpacks claim to be weatherproof - I assume there's fine print for hurricanes! Camera backpacks make travel with your photography gear much more fun. That means more photos whether you're in the garden or out in the wood camping. Photographers are creative types. I usually buy exactly what I want, ready to use! But there's much to be said for a DIY bag. Give these ideas a try. Might save you some money and that's always a good thing! Try a nylon or canvas messenger bag with a smaller camera bag inside. You can get a heavy duty bag at an Army Surplus store. When you buy a camera, it might come with a padded pouch or small camera bag. Or you can buy inserts or divider kits that fit nicely into a messenger bag. Look at Tenba or Domke inserts and Kata customizable divider systems. Hey ladies! What about those diaper bags you're not using anymore? They're great for hauling lots of camera gear plus your lunch, water and a sweater. And get a few inserts to protect each camera piece. I was in Nairobi with a couple of days to sight-see before a safari -- just after the bombing of the US Embassy. Always a dangerous city and the first time I ever felt tense. Not a good place to show off a spanking new photography backpack. So, I bought an ordinary mesh shopping bag and used a thin nylon bag as a lining. Only used a small SLR and kept it discretely in my shopping bag. Sure its getting more dangerous to travel. But life's all about new experiences - and new gardens! My advice - learn to travel safely. Be the inconspicuous tourist -- the un-tourist! That means blending in with the locals. Don't advertise your expensive photography gear to thieves. Unfortunately, camera backpacks are thief-magnets! The professional thief is well acquainted with National Geographic backpacks, Lowepro and every other camera bag on the market. Covering the label won't help. They just know! Travel's your chance to use those recycled camera bags! Remember I said to look like a local? Well, get a mesh shopping bag, whatever the locals are using, and put camera inserts or a small case inside. You could still be parted from your bag but the chances just decreased. And now you have a shopping bag! Think about this one! If you were a thief, would you rip off some dirty diapers? Think old diaper bag! Brilliant way to camouflage a camera. Some countries are worse than others. For instance, Italy's the theft capital of the world. They won't even publish statistics. Be concerned if a group of "gypsy" children are close by. Now THEY have true talent. They're professionals. But being kids, who'd suspect? Tourists never see it coming. My personal travel hints for Italy - switch all camera backpacks to the front with your arms wrapped around -- like you're hugging your long-lost friend. Always be aware of what's going on around you. And, unless you have eyes in the back of your head, hold everything front and center. Italy's an amazing place. 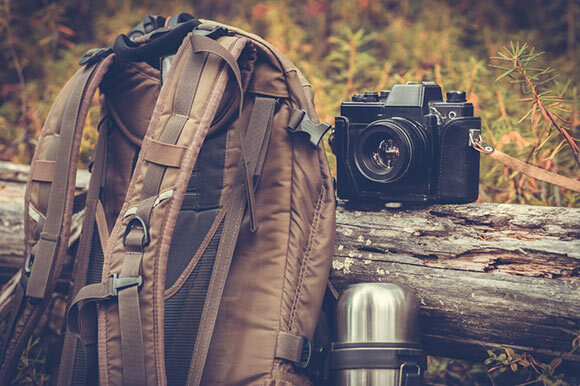 Keep hold of your camera backpacks and make sure you go home with fond memories and fabulous garden photos! Never let the fear of theft keep you from enjoying your photography outings or travel. Get out and relish every minute of your photography experience! Just get some camera insurance... and... be travel-smart!